Why was Kenley not auf'd? Why? I'm really not liking her and her attitude. How can a person be rude to Tim? It's just wrong. I have many things that I would like to talk about, but I'm too busy sniffling with the worst allergies I've had in several years. What the heck is blooming that is doing this to me? I don't like it one bit. I get no sleep because I can't breathe. I even went to to the doctor for the first time in nearly two years, and he gave me a prescription for Zyrtec, which seems to have made my taste buds non-functioning. The sole purpose of this entire paragraph is just to illustrate how grumpy I am right now, was I successful? Also, thanks for all the shorts love, I really like to respond to comments as much as possible, but I just haven't had it in me to deal with e-mail either. I'll get to it eventually, so please don't think I'm being rude and ignoring all the nice comments and good advice about the blue birdcage. So, this is just a quick drive-by post to discuss Project Runway (and to let you know that I am grumpy and sniffly and tired. And my eyes itch. And I have comments to reply to.). How about that Leann? Yes, I called it way back in the beginning. She is definitely my favorite. Her last two designs have been really great, I thought. Too bad about Stella, although she was kind of on borrowed time, anyway. It was a close call between her and Joe this week, but his drag queen outfit was so good a couple weeks ago, I think that may have helped him stick around to see another week. Who do you think will make the final three? I'm going to go with Leann, Korto and maybe Terri? Discuss please. I don't think I ever mentioned here that I studied Clothing and Textiles in college. In high school I worked in a drapery workshop, and in my 20's I did some design consulting for an import company, as well as lots of little odd jobs from slipcovers to wedding dresses. I've always loved textiles, and while I'm hardly cutting edge in the fashion department, I do love clothes. I haven't done a lot of sewing for myself the past few years, and I hope to change that as I continue to lose weight and look better. I particularly love the little details that make an ordinary piece of clothing special (like sewing little petals all over a plain old t-shirt) :o). I loved my couture techniques class, and textile science class, and the theater classes where I got to work backstage on various productions. Lately, though I've been thinking about one of my very favorite classes: costume history. It's so interesting how clothing permeates so many aspects of history. Art, religion, industry, it's all intertwined with what people wore. As you might expect, I love me a good old fashioned costume drama. 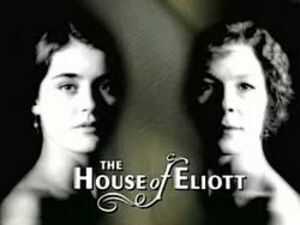 I'm currently re-watching one of my favorite of all time, The House of Elliot. It takes place in 1920's London-one of my favorite time periods, fashion-wise, and one of my favorite places. It's the story of two sisters left destitute by their father. They start making clothes to support themselves, and eventually open their own fashion house. I was lucky enough to be in London when the V & A was doing an exhibit of costumes from the series. They really were just as exquisite close up as they were on the screen. 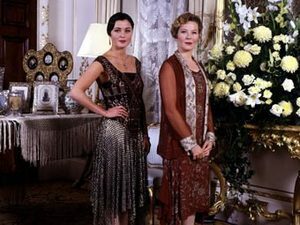 Watching The House of Elliot again makes me want to make a 1920's style gown with lots of hand beading and embroidery. One day I think I really will do this, just for fun. Another favorite (in a different sense) costume drama, Project Runway started again this week! I didn't even know they were doing another season so soon. Luckily, my trusty Tivo was on the case and recorded it for me, so it was a nice surprise to come home to on Wednesday. Did they not do a preview show this time, where they show the selection process? It seems like there are more designers this time, and the introductions at the beginning were so quick, there's no way to keep them all straight. Is anyone up for a PR discussion group? Let's do it in the comments! I'll start here. First of all, super-tan Blayne and his stupid 'girlicious' needs to go soon. I didn't like Christian at first, last season, but the little twerp grew on me, and he is extraodinarily talented, and I loved him and his 'fierceness' by the end of the season. I already know that Blayne and his stupid hat and sniffles is not going to ever endear himself to me. And yes, his design was daring, but it was also hideous and I hated it. There was a potholder on her shoulder. A potholder! Not deconstructed or anything, just stuck there. I can't even post a picture of it because I hated it so much. The cup dress was so clever, and talk about labor intensive! I loved how Daniel used the rims like piping. I loved Kelley's skirt of vacuum cleaner bags, how great was it that she dyed and bleached it? I thought the spiral notebook hooks were genius, and I even liked the gold pushpins adorning the waistband, but the coffee filter bodice? That really could have been done differently. I wish we could have seen more of the pasta dress, I loved the way the skirt moved down the runway, and the ovenmitt bodice was so cute! I thought the pink candy dress was sort of cute, and I decided to find out more about Leanne. I really like her aesthetic, her designs are so pretty and soft and feminine. She has an etsy shop! How cool is that? I would definitely wear something made by her. Look at this one! The construction is so fascinating to me. I'd like to know where she gets her fabrics, they all drape so nicely. Look at some of her sold items on etsy to see more. I thought the judges were right on with the bottom two. I probably would have sent Stella home, just because her trash bag dress looked like...trash bags. At least Jerry put a lot of work into his weird little raincoat, and made a dress to go underneath (although I use the term dress loosely). Maybe if he had foregone the rubber gloves and boots he might have had a chance. What do you think? Did any designers stand out for you?